Definition at line 43 of file llviewergesture.h. Definition at line 55 of file llviewergesture.cpp. Definition at line 59 of file llviewergesture.cpp. 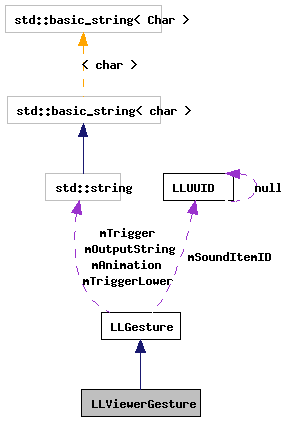 Definition at line 67 of file llviewergesture.cpp. Definition at line 72 of file llviewergesture.cpp. Definition at line 107 of file llviewergesture.cpp. References ANIM_REQUEST_START, CHAT_TYPE_NORMAL, FALSE, gAgent, gAnimLibrary, gChatBar, LLInventoryItem::getAssetUUID(), LLInventoryModel::getItem(), gInventory, LLGesture::mAnimation, LLGesture::mOutputString, LLGesture::mSoundItemID, LLUUID::null, send_sound_trigger(), LLAgent::sendAnimationRequest(), LLChatBar::sendChatFromViewer(), LLAgent::setAFK(), SOUND_VOLUME, and LLAnimationLibrary::stringToAnimState(). Definition at line 91 of file llviewergesture.cpp. References doTrigger(), FALSE, LLGesture::mTriggerLower, and TRUE. Definition at line 77 of file llviewergesture.cpp. References doTrigger(), FALSE, LLGesture::mKey, LLGesture::mMask, and TRUE. Definition at line 63 of file llviewergesture.h.